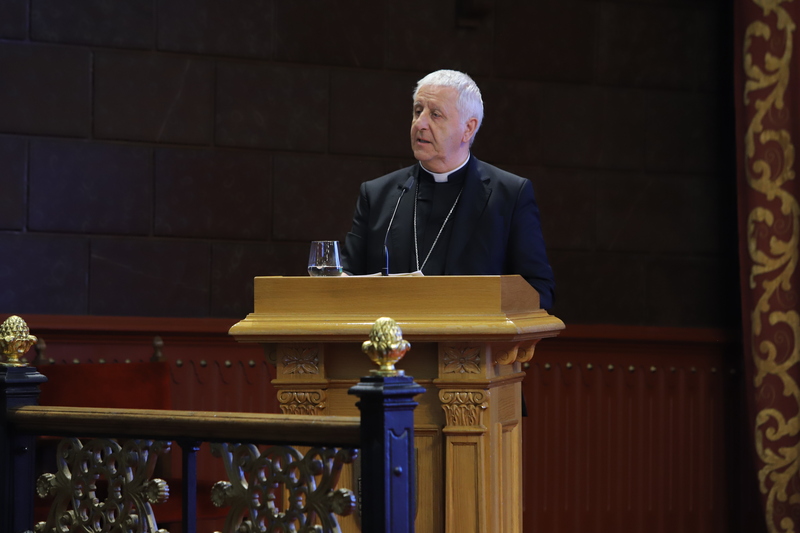 Early this morning, before the official inauguration of the IAJU Assembly, Cardinal Giuseppe Versaldi, Prefect of the Congregation for Catholic Education and Gran Chancellor of the Pontifical Gregorian University gave the first address. Versaldi set the theme for the Assembly, “Transforming our world together” by mentioning the recently published Apostolic Constitution, Veritatis gaudium, by Pope Francis. In fact, in Versaldi’s opinion, the introduction of this document by the Pope could be considered the “higher education policy” of our Holy Father, offering a good source of inspiration for the purposes of the IAJU Assembly. Pope Francis expects an ambitious contribution from the Catholic universities to this great transformation which he himself calls a “cultural revolution”. Said revolution is obviously not a political or ideological revolution, or merely disrupting order and traditions, but a “revolution of love” as Pope Benedict stated in a speech. It is aligned with St. Ignatius’s discovery: “the greatest transformation is one of heart and soul touched by God’s word and Spirit”. That is the the Church’s humanizing message of salvation. A message of hope for a world in need of transformation in Christ. If we want to transform the world, we need to leave our comfort zones and join with others to approach the peripheries. Concerning this point, Versaldi’s words brought to mind the Jesuits’ call to the frontier: “The Church needs you to go toward the limits, sometimes even beyond them, where human resources, competencies and capacities fail. There, with the weak, we feel our own weakness. There, we must depend on God’s grace. But there we can experience, at the same time, an even greater strength by collaborating with God and with others”. Versaldi also warned the Jesuit Universities that they will not be able to transform the world if they remain a “closed club” of self-referential institutions. Catholic universities should insist on “dialogue” as their modus operandi or their “way of proceeding, as you Jesuits would call it”. Dialogue “does not mean that we speak only with those who share the same opinions”. It will have to be a broad dialogue, respectful, “but also with a clear personal standpoint, with a high and positive identification with the Church”.